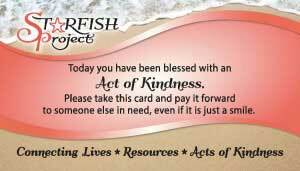 If you would like to register a “Starfish Project Pay It Forward” card or just share with us an act of kindness you were involved in or witnessed, please email it to us at starfishproject21@gmail.com. If you do have a card number, be sure to add that to the subject line of your email. 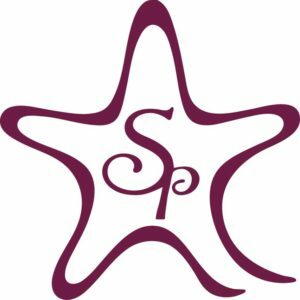 Here at the Starfish Project, we feel that it is not about names, but true acts of kindness. All names will be removed from the stories when we post them. Card # NA – I arrived at the office as usual. When I went to see if there was anything in my mailbox I found a small glass bowl filled with chocolates and other sweet treats. I have known idea who left it, as it wasn’t there when I left the night before. It really did brighten my day and I will be looking for an opportunity to pay it forward. I pray that whoever left it – is blessed abundantly. Card# 1775 -I decided to head up to Legends to do some shopping and get some much needed work done on my family’s home we are looking to sell. After getting to my family’s home to find out it was broken into, my day was already off to a bad start. From here, I decided to go ahead and head down to Legends for some shopping which turned into a bigger disaster. Not being able to find what I wanted and locking my keys inside my car, I began to lose my cool in the parking lot. All of a sudden, a lady walked up to me and said, “here you go, looks like you’re having a bad day.” In the mood I was currently in, I grabbed this card not knowing what it was still a bit later. Finally after my family came with my spare keys and I got home, I began pulling items out of my jean pockets and placing these items on my nightstand. This is when I found out what I was handed and how it impacts me but most of all, the purpose of why I was given this. I look back at this moment now wishing I could thank the lady who decided to make my day by sharing this simple card with me and now with 150 envelopes full of these cards, I look forward to making someone else’s day. Card# 4569 – My daughters bff had ACL surgery today (Christmas Eve Eve). I went to the hardware store and bought her a grabber/pickup tool. Card# NA – Young couple… Needed full tank of gas. And gave $100 GC for groceries. Thx for the inspiration!